With our weather being near perfect, this is one of my favorite times of year to live in Spring Texas. We have very little rain and low humidity. And the temperatures hover between highs of 75 – 80 degrees with lows of 55 – 60 degrees. The real estate market is also slower, providing Rick and I an opportunity (ie.. not the usual “don’t have time” excuse) to enjoy the beautiful weather. 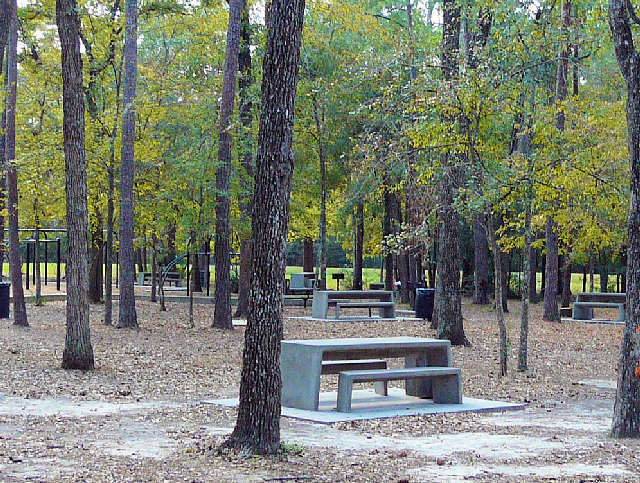 So with no more excuses, I decided that next Sunday, we were going to have a picnic lunch and enjoy a couple of hours in one of our many Spring Texas parks. I am ashamed to admit that I drive by our parks numerous times a week but rarely do I make the time to visit them. Well, that has now changed. 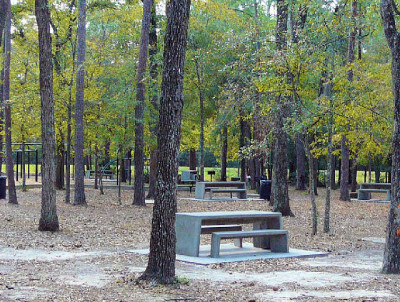 For the last 3 Sundays we have packed a lunch and headed to a different park in the Spring Texas area. We have picniked at Meyer Park, Collins Park, and now Mercer Arboretum & Botanic Gardens. With each park containing different amenities, its hard to say which park is the BEST park. I think it really depends upon which activity you want to do at the park. If I wanted to play or watch soccer, I would definitely choose Meyer Park. Meyer Park has 26 soccer fields and on a Sunday afternoon the fields are a buzz with activity. We did notice that finding a parking spot can be a little challenging during the 2:30 – 3:00 pm time frame which is between soccer games. Meyer Park also has wonderful paved trails for bike riding, roller blading, or just walking your dog. If you are a fisherman, you will want to check out the park’s 3 acre lake that is stocked with fish. Since I am not much of a fisherman or a fisherwoman for that matter, I did not do any fishing. But I did enjoy walking around the lake and watching the turtles sun bathe. The picnic tables are plentiful. As we had more difficulty deciding upon the ideal one than actually finding one. View photos of Meyer Park. If I wanted to watch baseball, I would choose Collins Park. Collins Park is home to the Spring Klein Girls Softball League and has 5 softball fields and 4 baseball fields. Games were taking place on each of the baseball fields the Sunday we visited the park. Numerous gatherings and birthday parties were also taking place in the park. I was particularly envious of one of the gatherings. Because I smelt the most lip smacking barbecue chicken and the sad part was I was not invited. Instead I had to be content with my cold sandwich from Jimmy John’s. Jimmy John’s makes a good sandwich but it didn’t smell nearly as good as that chicken. View photos of Collins Park. Today Rick and I picnicked at Mercer Arboretum & Botanic Gardens. We liked the picnic areas of Mercer the best of the three parks. The tables were located at the edge of the woods and provided us with more of a rustic woods setting than a park setting. If that makes any sense at all. After lunch, we went exploring the trails. The trails are non-paved and well marked. So we did not have to leave a bread crumb trail to find our way back. We decided to take the trails to the Bald Cypress Pond, the Oxbow, and the Hickory Bog. 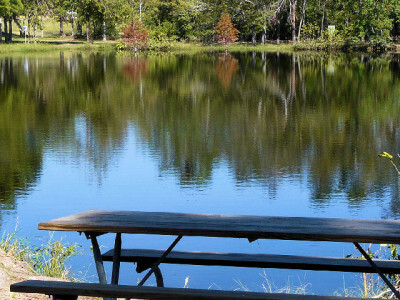 The Bald Cypress Pond and the Hickory Bog both have benches which we used to sit for a while and take in the scenery. That is until Rick said we had to go because he was getting eaten by mosquitoes. He wore a short sleeve shirt while I on the other hand wore a long sleeve shirt. Next time we go to Mercer Arboretum and Botanic Gardens to walk the trails, how much do you want to bet me my husband will be wearing a long sleeve shirt? Which park will we be at next Sunday? I don’t know yet. But if you want to join us give me a call at 281.804.8626 and we will meet. If you want to view Spring Texas homes next Sunday, we can do that too. But we will have to wait until 2 pm because I am enjoying my Sundays in the Park until then.